It is common for man to easily make assumptions, form theories and jump into conclusion about things he's not even sure of. everything. But this is more folly than wise. You've often heard some quotes like "All men are the same" "All women are the same" , "All men are liars, all women are deceptive" etc..
All these fake postulations are made by people who have had few experiences and the "generalized" it to the whole. Truth is you cannot make such statements except you have experienced the character of either all men or all women. Some claim that some things are impossible and that you shouldn't try. But many things have been invented by people who didn't believe in assumptions formed made others. It was once thought flying was impossible and that the earth was round. What's up with those postulations now? The danger in making these dangerous assumptions about life, other human beings or events is that it has a way of repeatedly creating the experience of those assumptions for you! That's how dangerous it could be, because when you hold something to be very true, you tend to see it even when it is not there and you miss out on opportunities. When I was a very little kid, my uncle told me that when it was very dark, a horrible monster would come and stay under our staircase and that it would carry me away if I went downstairs. I immediately held this statement as true and I strongly believed that a monster lived there. Hence, the fear was real and I usually stayed upstairs at night and only went downstairs when accompanied by someone. It was with time that I decided to confront this monster, even though I can remember running down very fast the first Time I tried it.. But then I discovered that there was no monster there. And even boasted to my uncle later that there was nothing there. Often times we form bad opinions about people, situations and events without attempting to understand them. We just hear what someone else has said and we immediately believe it to be true. This has hindered many people from making progress. I have found from personal experience that some of the people I could've easily written off as bad people based on what I've been told about them have turned out to be the very best kind of people from my experience with them. And I've achieved what some of my peers thought was impossible. It is wrong to believe what you're told about someone based on hearsay. You have to get to experience that person yourself before you can say something too about him or her. We must make that attempt towards being sure and convinced of something rather than have blind belief in what other people tell us or what we have just assumed to be true. 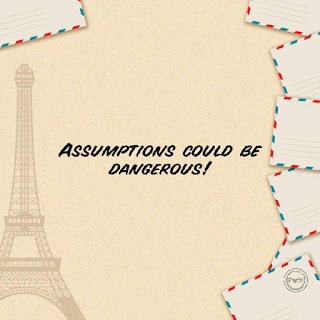 Human assumptions has often been wrong because no attempt was made to find out and be very certain. When you are very sure of something, there will be no need to guess or assume anything about it. You only guess when you are not sure. And you can never be sure based on what people tell you because perceptions are different. The only way is to find out if you're not ready to gamble. Many relationships have failed because of false assumptions. One woman had been enjoying her marriage to her dear husband until one gossip came around and told her that she saw her husband somewhere with a woman.. And then angrily without questioning anything the woman went to meet her husband and accused him of cheating on her. The man couldn't say a word.. It was after she had exhausted her aggression that it was later understood that the lady with her husband was a distant cousin who just flew into the country. And that's what assumption without appropriate verification does. 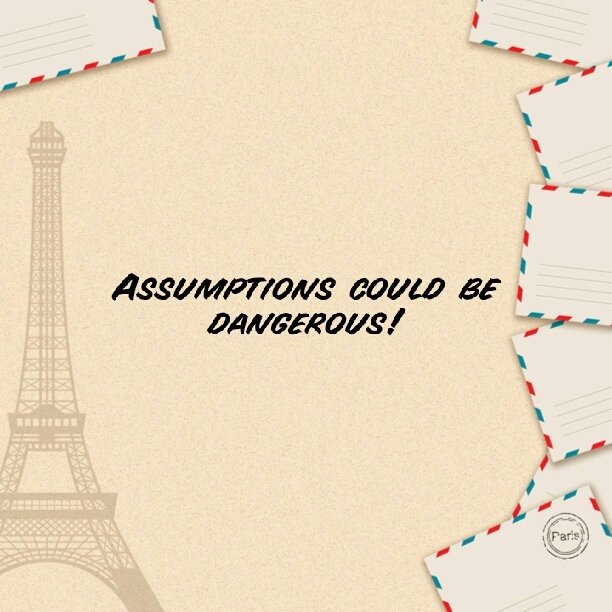 Assumptions could create mistrust and the downfall of any relationship commences when the trust has been shaken. You don't just assume things in your head and believe them to be true. It doesn't work that way. How would you feel if I never knew you and I strongly believe you were bad, when I don't even know a thing about you? That's how this assumption thing works . We often think everybody thinks the Same way as we do, but that is very wrong. I have learnt to ask questions. Why? What? Where? How? When? I continue to ask questions and seek to experience because I don't assume to "know it all"... The one who claims to know it all is usually the one who knows nothing because there is no more room for learning in his mind. Whenever we hear something, let us not be quick to accept it. Whenever we suspect something, let us not be quick to believe it. Whenever we've experienced the character of a few people, let us not be quick to generalise. We must pause, reflect, think and find out certain things before we believe them and hold them as true. That way, we will be free from dangerous assumptions. Bold winners don't just assume, they dare to find out and be certain of things before believing them. Thank you Clinton. Bookmark our blog.